Open: Daily 8 a.m. – 5 p.m. or 6 p.m. during Daylight Savings Time. Until 1913, Forest Lawn Cemetery was a mere 55 peaceful acres on the edge of Tropico (now Glendale) in Southern California. Then Hubert Eaton took over. Eaton was not the first to sell grave plots to families still living — that had been pioneered by Boston’s Mount Auburn Cemetery (America’s first nondenominational garden cemetery) in 1832. However, Eaton was the first to be aggressive about “pre-need” sales, going door to door to evangelize about the peace of mind one could have, knowing one’s family wouldn’t be shopping for a gravesite during the sharpest pangs of their grief. To his credit, Eaton adamantly believed that plots at Forest Lawn should not be sold as property speculation (in which the price of burial space increases as the cemetery fills), but that they be purchased as a familial obligation, like buying insurance. Soon he’d sold most of the original cemetery and bought up the surrounding land. Forest Lawn Glendale now occupies 303 acres. Eaton undertook a tour of Europe, visiting cemeteries and art museums, looking for “improvements” he could transplant to his own burial ground. For the most part, Eaton — a staunch Baptist — found cemeteries depressing. Strangely enough, he thought they put too much emphasis on death, loss, and pain. Eaton found the fields of sculpted stone ugly. He came back with a revolutionary idea: henceforth, above-ground monuments would be forbidden at Forest Lawn. 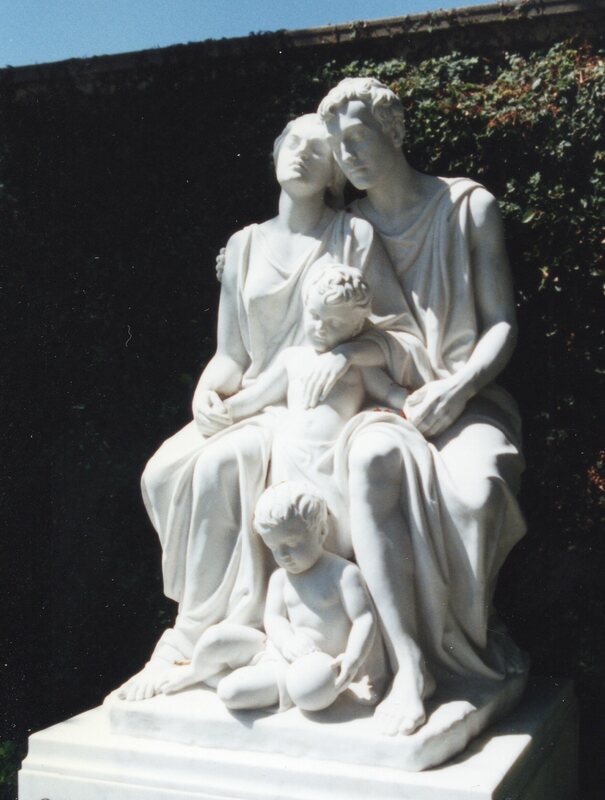 In their place, the cemetery would provide occasional marble sculptures on authorized subjects like motherhood or valor. The very wealthy could purchase one of these pre-approved monuments as a grave marker. He restricted everyone else to a bronze marker set into the sod, because bronze did not chip when driven over by a lawnmower. Although they carefully don’t use it as a marketing tool, Forest Lawn Glendale is the final resting place for many of Hollywood’s famous names. Among the famous at rest in Forest Lawn are Elizabeth Taylor, Michael Jackson, Walt Disney, Errol Flynn, Jimmy Stewart, Chico Marx, Humphrey Bogart, Sammy Davis Jr. and W. C. Fields. L. Frank Baum (author of The Wizard of Oz) rests under a heavy upright granite monument in the original section of the graveyard. Clark Gable and Carole Lombard supposedly lie in the Sanctuary of Trust, but I haven’t been able to locate them yet. Even with Permanent Californians: An Illustrated Guide to the Cemeteries of California — which I highly recommend, should you find yourself visiting LA — it is difficult to find anyone. Forest Lawn doesn’t sell maps of graves like Hollywood Forever does. To this day, Forest Lawn continues to be a cemetery that denies death. “The Builder” didn’t want anything challenging or threatening or sad in his masterpiece, so he forbade depictions of grief and sorrow. Even the painting of the Crucifixion that hangs in Forest Lawn’s purpose-built Hall has no death in it. The thieves have yet to be nailed to their crosses. Christ waits patiently for his sentence to be carried out. Forest Lawn’s literature hypes the painting (tall as a 20-story building, if it were stood on end!) as the only depiction in the world of Christ awaiting his martyrdom. Of course Forest Lawn has a gift shop. It offers glossy calendars of their marble statuary, or tchotchkes of their version of David, or replicas of items in the museum. This entry was posted in Cemetery of the Week and tagged California cemeteries, cemetery tours, Forest Lawn, Los Angeles cemetery. Bookmark the permalink.